Cento_s7 is a product of obsession. ASSOS set out to create the very finest long distance bib short; the resulting T. Cento_s7 is an immaculate culmination of this mission. From the fit to the materials to the one-off ASSOS touches, theyre a game changer. All the crux elements are designed with the end result in mind. Our new comfortFit offers a more generous fit around the middle but retains an ideal supportive fit on the legs. The padded insert is our plushest and most forgiving, with more memory foam than any other in the s7 range. Then beyond the fundamentals, the details and innovations are exquisite. The single panel, single seam construction crucially removes the need for a front seam; the brand new kuKuPenthouse is a unique solution to ensure security and comfort for the male anatomy. Cento_s7 are performance cycling shorts that want you to go all day. 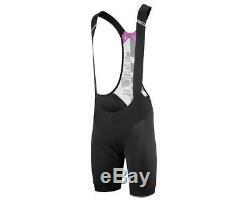 Cento S7 Cycling Bibshort Men's Large Black Road Mountain Bike NEW" is in sale since Friday, October 12, 2018. This item is in the category "Sporting Goods\Cycling\Cycling Clothing\Shorts". The seller is "cycleoverstock" and is located in Westfield, New Jersey. This item can be shipped to United States, Canada, United Kingdom, Denmark, Romania, Slovakia, Bulgaria, Czech republic, Finland, Hungary, Latvia, Lithuania, Malta, Estonia, Australia, Greece, Portugal, Cyprus, Slovenia, Japan, China, Sweden, South Korea, Indonesia, Taiwan, Thailand, Belgium, France, Hong Kong, Ireland, Netherlands, Poland, Spain, Italy, Germany, Austria, Israel, Mexico, New Zealand, Philippines, Singapore, Switzerland, Norway, Saudi arabia, Ukraine, United arab emirates, Qatar, Kuwait, Bahrain, Croatia, Malaysia, Brazil, Chile, Colombia, Costa rica, Panama, Trinidad and tobago, Guatemala, Honduras, Jamaica, Antigua and barbuda, Aruba, Belize, Dominica, Grenada, Saint kitts and nevis, Saint lucia, Montserrat, Turks and caicos islands, Barbados, Bangladesh, Bermuda, Brunei darussalam, Bolivia, Ecuador, Egypt, French guiana, Guernsey, Gibraltar, Guadeloupe, Iceland, Jersey, Jordan, Cambodia, Cayman islands, Liechtenstein, Sri lanka, Luxembourg, Monaco, Macao, Martinique, Maldives, Nicaragua, Oman, Peru, Pakistan, Paraguay, Reunion.